To save or not to save? Zhang San Jin (Sheng Teng) makes a conscious decision to save Qiu Yue Jin (Cao Hai Jun) in spite of the repercussions, which leads him to Hua Er (Xu Ling Er), Qiu Yue Jin's adopted daughter. Ten years ago, Zhang San Jin was a man from the province who arrived in the big city carrying his blind mother on his back. He was a blue collar worker accustomed to physical labor and even so, mother and son harbored high hopes for a better future. A chance encounter brings Zhang San Jin close to Hua Er, a kind and stunningly beautiful young woman who has lost her vision and their budding friendship slowly blossoms into romance. Hua Er eventually finds success as a singer, making enough money for a chance to see again. Realizing that Hua Er has risen beyond his grasps, Zhang San Jin faces a moral dilemma between wanting what's best for Hua Er and wanting her to stay as she is. 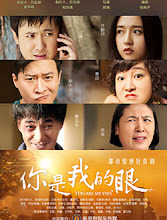 You Are My Eyes is about typical people, not the upper echelons of society so often portrayed on TV but the people behind the scenes working tirelessly towards their dreams. Let us know why you like You Are My Eyes in the comments section. Please also share these fun facts using the social media buttons below.